10.55" x 4.37" x 1.57"
Our turn-around time is typically about one week and our system will notify you automatically at every stage of your RMA process. Comments: They need to reactivate this card,there's nothing wrong with it. Comments: I've never had any issues with Nvidia cards until I got into the new Nvidia 5 series. I started out with a MSI 560ti SOC that worked awesome for the first 3 months then it started artifacting. 2 RMA's later they sent me one of these but the OC'ed addition because I refused a 3rd 560ti as an option. I must say it was a pain going so long without a decent video card but MSI cross-shipped for me and there tech's where very helpful when I called about the issue with this card. I've owned several MSI Nvidia cards in the past 6600gt, 6800gt, 7800gt, 8800gtx, gts250, and never had an issue. So when I buy a video card my first choice is to go MSI, and I'm glad I did because they took care of me. Comments: I've read some of the other reviews and heard some bad things about this card shortly after I ordered it. Honestly, I think it's perfectly fine. The design of the card I got is different than the one shown, i.e. the fan is a bit smaller and the card itself is shorter (which is a plus IMO), and apparently this one has a louder fan. I don't know about that, but this replaced 2 GTX 280s in my system and it's certainly a lot quieter than those, which I didn't consider to be that loud in the first place, so I'm satisfied. With the recent $50 rebate this card was a great buy. We would like to apologize for the issue you have experienced with this particular VGA. Please email me directly via USUserSupport@msi.com your VGA's serial number and your complete contact information, subject heading "EAHN570GTX". I would like to help you get this resolved. Comments: Not a reference 570 design. 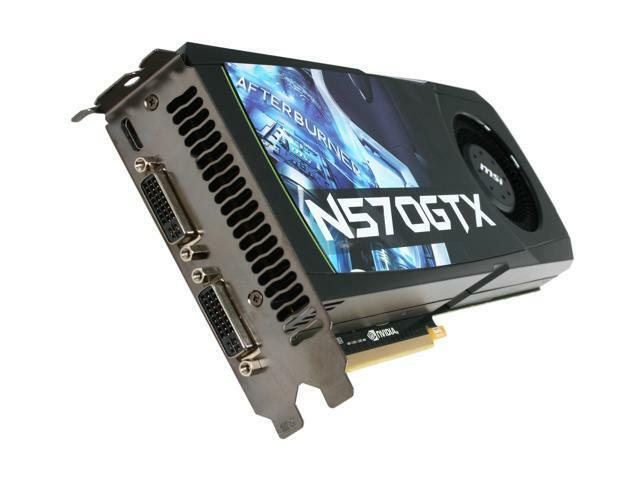 V801 in the model # I believe is a reference design, which is in the overclocked version of this card (N570GTX-M2D12D5/OC). But reading those reviews, I'm not sure you're any better off due to artifacting. Comments: I will update if anything changes, for now I am posting this so others think twice before making this purchace.